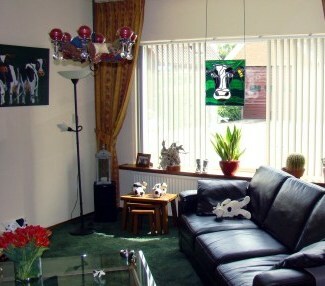 A friend of mine collects cow figures in various shapes and materials such as porcelain, oil, textiles, metal and plastic. 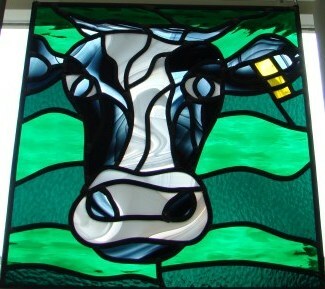 After she had helped me with the catering of a beginner's course in stained glass, I created for her a stained glass panel containing the image of a cow. 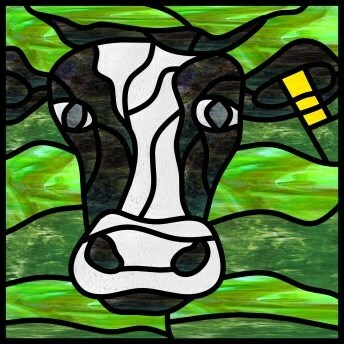 The stained glass window now hangs in the window of her living room, and the light that shines through the glass harmonizes with her other bovine decorations! By good luck my sister lives on a farm in the rural Achterhoek region at the eastern end of The Netherlands. There, black and white cows with yellow ear tags amble about, so it was simple for me to take a suitable photograph on which to base my design. I imported the photograph as a background image in Glass Eye 2000. In constructing the panel I used two shades of green for the background and kept the cow in black and white with a yellow ear tag. I chose Spectrum and Wissmach glass, which I obtained from the Jilleba stained glass studio in Leiden. Below are a few other designs I'd like to share with you. I learned glass painting through a course at FOKA Glaskunst and I'm now attempting to master this technique. Here is a family crest I created. I also use a lot of antique mouth-blown glass from Lamberts. This glass has a beautiful luster and a deep shine, and is available in many colors. Through a friend I got a beautiful design of a quilt, and have redrawn it in Glass Eye 2000 as a stained glass panel design. 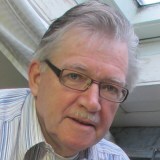 Jan ter Haar was born in the Achterhoek region of The Netherlands. In the 1980's he moved with his family to the west of his country where he taught painting at the local technical school. 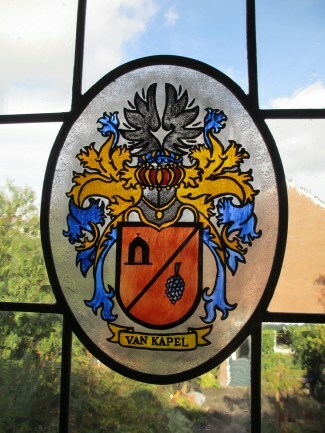 He first became acquainted with stained glass when a church in the village of Achterhoekse was restoring a memorial window, and from that moment Jan began to read and collect books on stained glass. 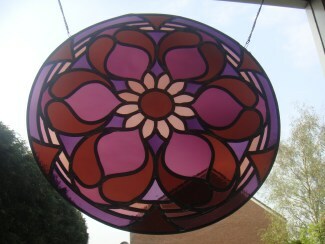 He attended stained glass courses and in his spare time began designing stained glass artworks. He owns the Professional Edition of Glass Eye 2000. After his early retirement, Jan is doing with more stained glass and also teaches courses to novice enthusiasts. You can see more of Jan's work at his website or you can contact him by email.